Hobart’s Henry Jones Hotel is one of only a few dedicated art hotels throughout the world and one that has transformed the historic site which was once the location of one of Australia’s most successful companies – H. Jones and Co. Pty Ltd IXL. A former jam factory on Hobart’s waterfront, the building fell into neglect in the 1990s but was soon to be revitalised as part of the restoration of Hobart’s waterfront. Tasmanian architect Robert Morris-Nunn won a selection process to recycle Hobart’s oldest waterfront warehouses. By blending the architectural and warehouse/factory elements with contemporary design and art the architect was able to fulfil a vision of interacting with and providing benefits to the wider community. The building’s atrium features an imposing glass roof with structural components of slender steel bows. Triangular sails droop and provide a filter for direct sunlight. False floors cover the original irregular flooring with the enclosed space used to duct warm air from the atrium to other parts of the building. A five-star hotel featuring 56 individually designed rooms and suites all reflect the confluence of art, heritage, tradition and nature, all complemented by modern touches. Over 400 artworks are continuously changing presented by a diverse range of established and emerging Tasmanian artists. The redevelopment of the Henry Jones and neighbouring buildings along Hunter Street has been responsible for transforming the northern side of the Hobart docks into a desired destination in its own right to rival the tourist mecca of Salamanca place on the southern side with its revitalised warehouses. The Henry Jones Hotel was opened in 2004 and developed by the Vos Group. Circa Morris-Nunn Architects have been responsible for many Tasmanian developments of interest including Saffire Resort, Port Arthur Resort, Islington Hotel and Customs House Hotel. The hotel has been attracting art lovers from all over the world and continues to be a focal point for the arts community in Tasmania as well as discerning travellers. 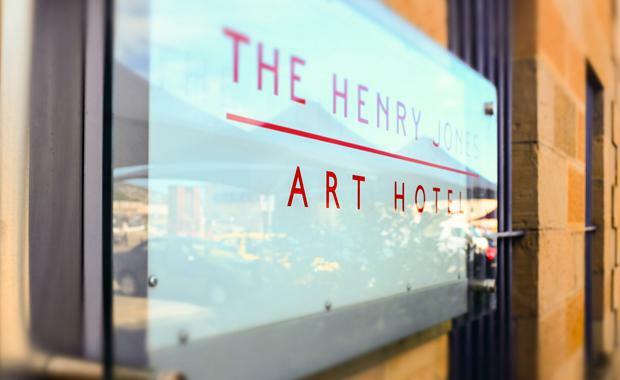 Henry Jones Art Hotel is part of Tasmania’s Federal Hotel Group, purchased by them in 2008.